As you’ve likely heard, the County Administration is proposing to dramatically weaken the development rules that protect us from crippling traffic congestion. A public hearing has been scheduled for 7pm Tuesday April 2 in the Gilliam Building, 67 Reads Way, New Castle. This is our chance to have our voices heard. Please come to show your opposition to this deeply flawed proposal. The implications for all County residents are profound. The State Office of Volunteerism through Friday, April 5, 2019 is accepting nominations for the Governor’s Youth Volunteer Service Awards. These awards recognize the important contributions that Delaware’s Youth volunteers, 17 years old and younger, make to their communities. Award recipients will be honored on Tuesday, May 14, 2019 at a special ceremony at Polytech Adult Education Conference Center. The awards honor young Delawareans volunteerism in the areas of arts and culture, community service, education, environment, health, human needs, public service and social justice/advocacy. Volunteer efforts must have been performed during 2018; though prior volunteer activity can also be highlighted to show long-term commitment. The nominated individuals and group members must be seventeen years old or younger. Nominations must be delivered by Friday, April 5, 2019, to the Office of Volunteerism, Attn: Governor’s Volunteer Service Awards, c/o April Willey Williams State Service Center, 805 River Road, Dover, DE 19901 or emailed to dhss_VolunteerDelaware@state.de.us. Here is the link to the nomination form. INCYTE is pleased to host a community meeting on March 25, 2019 at 6:00 p.m. at the Blue Ball Barn at Alapocas Run State Park to discuss their redevelopment of 1701 & 1703 Augustine Cut Off, adjacent to their existing corporate campus (also known as New Castle County Tax Parcel Nos. 06‐143.00‐002, 06‐136.00‐126 and 06‐143.00‐010, formerly the Campanella Auto & Tire Center and the adjacent office complex). The proposed redevelopment includes the construction of a new 183,000 square foot state of the art laboratory building and an associated 2‐story parking deck. The proposed site plan will include connectivity with Incyte’s existing campus, landscaping, stormwater management and a continuation of the 8‐foot multi‐use path along Augustine Cut Off. INCYTE and their design team are working with the New Castle County Department of Land Use regarding the design of the site and would like to share their proposed plan with the community. 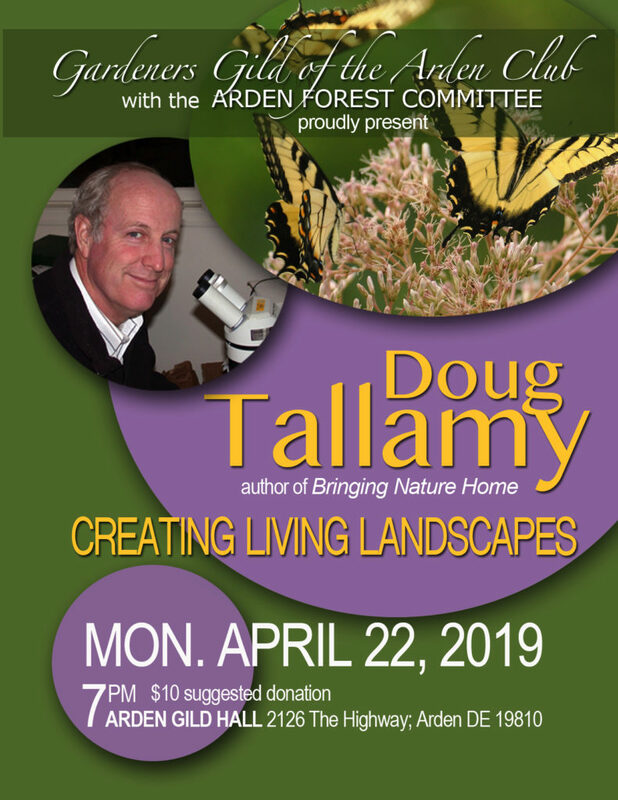 The Gardeners Gild of the Arden Club with the Arden Forest Committee are presenting a lecture featuring Doug Tallamy, author of “Bringing Nature Home”. The lecture entitled CREATING LIVING LANDSCAPES will be presented MONDAY, April 22nd, 2019 7:00 pm at the Arden Guild Hall 2126 The Highway, Arden DE 19810. CCOBH is pleased to continue the agenda from our previous New Castle County Seminars. This seminar will be held Wednesday, March 6th, 6:00 PM-7:45 PM at the Claymont Library. 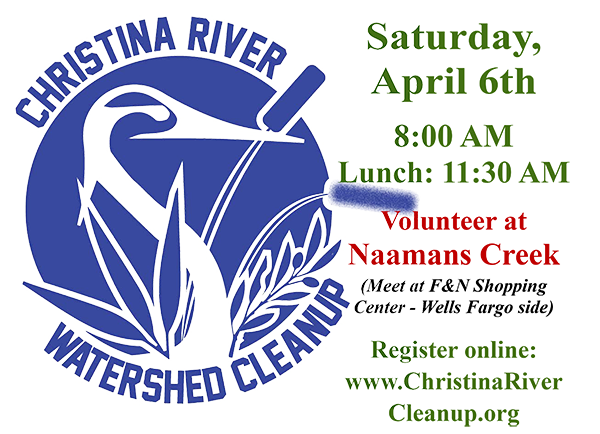 Naamans Creek Watershed Association (NCWA) has been coordinating its annual cleanup with that of the Christina Conservancy for the past 20 years. The Naamans Creek volunteers will meet at the back end of F & N Shopping Center (near the Wells Fargo side). Volunteers are invited to meet for lunch at 11:30 AM. The Naamans Creek contingent usually pulls out over 2 tons of trash each year from the stream and surroundings. This trash includes car tires (last year 42 tires were removed), shopping carts, wire, and wooden fencing. Most of the material is plastic bags and bottles, soda and beer cans and newspaper circulars. We clean about 16 different sites in our watershed. County Councilman John Cartier participated in the cleanup in 2018 1-800-GotJunk picks up our trash. Please post on your community page. The Naamans Creek Watershed Association would like input and assistance from residents so we clean as much of the area as we can. There are also quite a few tributaries of Naamans Creek that run through some parkland and some private property. If the main creek or a tributary of Naamans Creek (any small creek entering the Delaware River through Claymont, Perkins Run, or Stoney Run) flows through your neighborhood and has trash collections in it please notify Marianne Cinaglia at mcinaglia@aol.com. The Water Resource Authority puts Perkins Run and Stoney Run in the Naamans Creek Watershed. The next Household Hazardous Waste/Paper Shredding Event will take place on Saturday, March 2nd from 8:30am to 2:00pm. Know the rules. Recycle right. Click here to learn more. Have you ever seen a single stream recycling plant in operation? Delaware Solid Waste Authority has kindly offered to host members of local civic associations on a tour of its facility at 1101 Lambson Lane on Tuesday, March 12 and/or Wednesday, March 13 at 1 PM. For more information about DSWA please check out their webite at DSWA.com. If you are interested in attending the tour please contact Marianne Cinaglia at mcinaglia@aol.com ASAP so CCOBH can reserve a spot for you. Please state whether you have a preferred date.